Jaffa, with a population of 90,000, was the largest Arab town in Palestine, and had a long and twisting border with its neighbor, Tel Aviv. When hostilities broke out on the morning of November 29, 1947, Arab snipers fired repeatedly at the Jewish quarters along the border, and succeeded in immobilizing considerable sections of the Jewish city. In the first five months following the UN resolution, the number of Jewish mortalities amounted to dozens, with hundreds injured. Thousands of Jewish refugees, forced to abandon their homes, were billetted in schools and public buildings. The sniping and the bombardments not only led to the evacuation of the population of the southern suburbs, but also required the deployment of large forces in the defence of Tel Aviv. By April, 1948, it was clear that once the British left the country, Egypt would join the struggle against the emergent Jewish State. According to the partition scheme, Jaffa was to be part of the Arab state, and could be used by the Egyptian army as their base. In view of its proximity to Tel Aviv and the possibility of attack, the Haganah drew up a plan for the encirclement of Jaffa by occupying Arab villages to the south of the town (Abu Kabir, Jebeliyeh and Tel Arish). It was assumed that this strategy would lead to the surrender of Jaffa, but there was still the potentiality of Egyptian infiltrating Jaffa from the sea. 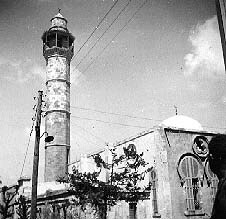 To foil this possibility, and to free up forces for other battle-fronts, the Irgun General Headquarters decided to capture Jaffa prior to the British evacuation. The decision also made political sense. By incorporating Jaffa into the State of Israel, its political independence would thus be precluded. The British, for their part, left a military force in Jaffa which was supposed to hand the town over to the Arabs at the appointed time. [...] Soldiers of the Irgun! We are going to conquer Jaffa. We are setting out on one of the decisive battles in the struggle for Israel's independence. Know who stands before you, remember who you have left behind. You face a cruel foe, who wishes to destroy us. Behind you are our parents, our brethren, our children. He was followed by Amichai Paglin (Gidi), operations officer of the Irgun, and commander of the entire operation. He outlined the operation strategy and explained that before the strike, mortar gunners would fire thousands of 3" shells. The company commanders commenced the detailed briefing, and the fighters boarded the vehicles in an elated mood. The operation was due to begin at night, but since deployment of forces was still continuing, the attack began in the early hours of April 25. The mortar gunners commenced heavy shelling of the center of Jaffa and the port area, and shortly afterwards two companies moved towards the pre-designated targets: one towards the railway tracks and the other towards the sea. The two forces encountered heavy fire from Arab fighters entrenched in the ruined buildings. After bitter fighting, in which the Arabs had superior firing power, the two companies retreated to their base. A debriefing at operational headquarters revealed that the size and strength of the enemy force had been underestimated. It was decided to send out sappers to blow up enemy positions, whereupon an infantry unit would occupy the liberated positions. The units set out again the following morning, but this time too they failed to achieve their objective. They encountered fierce machine-gun fire, supported this time by anti-tank weapons brought in by the British. The sappers succeeded in blowing up several enemy positions, but the infantry units failed to take them. Meanwhile, the bombardment continued and, in an atmosphere of terror and chaos, there was a mass exodus of the town's inhabitants by land and sea. That day, April 26, 1948, an agreement was signed between the Irgun and the Haganah, according to which the Irgun would implement only such actions as had been previously approved by the Haganah, and would carry out operations assigned to it by the Haganah's supreme command. Were it not for the British tanks and armored cars, we could have achieved the full objective of the attack. But the tanks are there, and we cannot ignore their presence. Under these conditions, it is no disgrace to halt the attack. We will hold on to the line we have reached, and leave a strong vanguard force there in anticipation of future action. The other units will be withdrawn from this front, where they can do no good. Several of the commanders who took part in the discussion supported this proposal. Others, headed by Gidi, argued that the enemy was about to collapse, and that fighting should continue. Begin's opinion was nevertheless taken as an order to halt the fighting, but it encountered fierce resistance when it reached the fighters, who insisted on another attempt. Begin subsequently "surrendered" to the wishes of the troops, and the order to retreat was revoked. On the third day of fighting, Gidi changed his tactics. Since it was clear that the fighters could not advance along the roads and alleyways exposed to enemy fire, it was decided to advance through the interior of houses by breaching their outside walls. A decision was taken to blow up large buildings to check the progress of the British, who had joined in the combat. To facilitate advance through open terrain, barriers made of sandbags were constructed. During the morning, thousands of sandbags were brought to the front, as well as drills and pick-axes to break down walls. The mortar gunners launched a heavy bombardment, and in the afternoon the onslaught began. The objective of the fighting, which lasted all day and night, was to cross the Arab quarter of Manshiyeh and cut it off from the town. The force captured position after position, and once Manshiyeh police station had been taken, Arab resistance collapsed. The fighters then encountered the British, who attempted to block their advance. Despite this unexpected intervention, the force managed to advance within Manshiyeh and by 7 am. the first fighters had reached the sea. This marked the end of the battle for Manshiyeh. Once Manshiyeh had been taken, total chaos reigned throughout the town. The mass exodus was at its height now and the British army assumed full responsibility for the defence of Jaffa. Reinforcements from Cyprus and Malta arrived, and British vessels were ready in waiting off the Tel Aviv shore. The British governor of Lydda district informed Israel Rokach, Mayor of Tel Aviv, that if the Irgun did not stop the fighting, the city would be shelled by tanks on land, and bombarded by ships offshore and by RAF aircraft. The ultimatum was ignored by the Irgun command, and the following morning the British began to shell the Alliance school area, where the Irgun headquarters were located. At the same time, British tanks and armored cars moved towards Manshiyeh, and directed heavy fire at the newly-occupied area. This was the first occasion on which the Irgun fought the British directly. Despite the clear superiority of the British artillery and armor, the Irgun fighters battled courageously and refused to retreat. Senior commanders went into battle at the head of their troops, and held up the British armored force by blowing up houses and scattering the debris on the roads and alleys. While the battle was raging, the Irgun command announced that if the British bombardment did not cease, the Irgun would direct its mortar fire at the German Colony in Jaffa, where the British garrison was located. In addition, the command announced that it was capable of shelling the remaining British army camps and inflicting casualties on the British on the eve of their departure from the country. The Lydda district governor then informed Rokach that the British were no longer insisting on total evacuation of Manshiyeh by Jewish forces, and demanded that the police station be cleared of Irgun fighters and restored to them, that Hassan Bek Street be evacuated to ensure free movement for British vehicles, and that the Irgun handed over to the Haganah the positions it had occupied in Manshiyeh. Instead of responding to British demands to withdraw from the police station, the Irgun command sent sappers to blow it up. Blocks of houses were also demolished, and the resulting debris obstructed the road to Tel Aviv. The Irgun then announced that it agreed to hand the positions over to the Haganah forces. On Tuesday night, after the fall of Manshiyeh, the Haganah launched Operation Hametz, with the objective of occupying villages south of Jaffa. In one of these villages, Tel Arish, the Arabs counter-attacked and the Haganah was forced to retreat after suffering heavy losses (33 dead and some 100 wounded). The next day, the Haganah requested that Irgun mortars shell Tel Arish so that the wounded could be brought out under cover of fire. 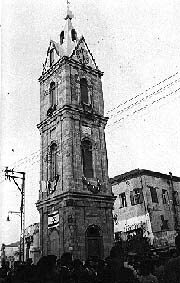 Having completed this task, the Irgun went on to despatch another of its mortar units to shell the village of Salameh, which it then occupied. On May 12, a deputation of Arab notables from Jaffa arrived at Haganah headquarters in Tel Aviv and, after negotiations, signed a surrender agreement. The next morning, May 13, 1948, the last British troops left Jaffa. 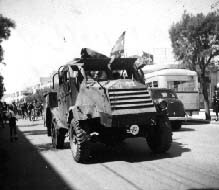 The same afternoon, a convoy of Haganah and Irgun fighters advanced towards Jaffa, led by an Irgun armored car requisitioned from the British. At the entrance to Jaffa they were greeted by the "Emergency Committee", accompanied by Arab notables who had remained in the town. Martial law was proclaimed in Jaffa, and a joint Haganah-Irgun command was established. The human cost of conquering Jaffa was heavy: 32 dead (half in battle against the British) and 77 wounded. In addition, 9 Irgun fighters were killed in the defence of Tel Aviv. There are no negotiations with dissidents nor will there be. If the dissidents disband their organizations and hand over their weapons, each of them individually can volunteer for the defence of the Yishuv like any other Jew, and if he is found suitable, he will be accepted into the ranks. Even before the negotiations were concluded, local arrangements for co-operation were being made between Irgun and Haganah combatants in response to the upsurge of Arab aggression. a. Irgun positions will be subject to the authority of the Haganah officer commanding the front, who will convey his instructions to them through a commander appointed by the Irgun. b. Plans for assault on Front A (Arab) and plans for reprisals on Front B (British) will require prior approval. Details, as regards object and time, will be clarified at personal meetings between representatives and experts. The Irgun will also be ready to carry out operations assigned to it. c. Irgun members will be bound by the principle of resistance to British attempts to disarm them. Under special circumstances, Irgun members in defensive positions will take into consideration the situation of nearby Haganah positions. e. Plans for arms acquisition will be drawn up after joint consultation and will be implemented by mutual agreement. f. Before this basic arrangement becomes operative, certain details remain to be clarified. This will be done by representatives and experts from the Irgun and from the Haganah. The meeting between the experts was delayed, and took place only on April 26, the second day of the assault on Jaffa. The agreement was binding from then on. The agreement was intended to establish a working relationship between the two organisations in the period leading up to the establishment of the Jewish state. The Irgun had proclaimed earlier that once the state came into being, it would lay down its weapons within state territory, and its members would join the national armed forces. Jerusalem, which was to come under international rule under the auspices of the United Nations, was a different matter. The Irgun would continue to exist in Jerusalem as an independent organization until the city became a part of the State of Israel.